In Centennial, Colorado Center Park offers community gathering and multi-generational recreation. 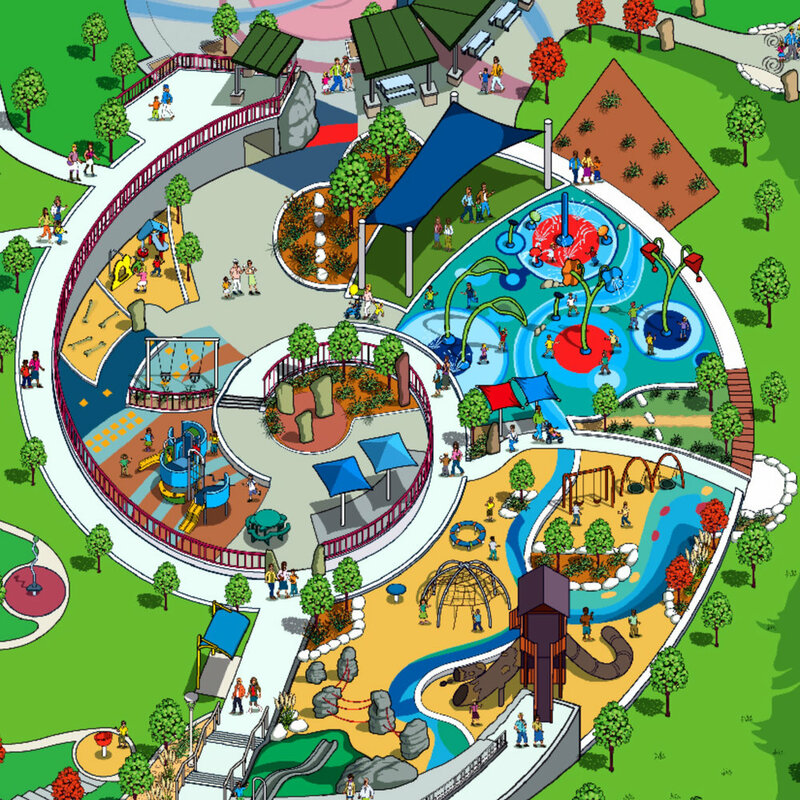 The unique playground has a large treehouse structure, a custom map theme climbing wall, a challenge course, sand play for tots, natural drainage ways, dramatic topography, picnic shelters, restrooms, and water splash pad and changing rooms. The City of Centennial, Colorado, wanted to create a central gathering for their 100,000 residents. Our team worked with their staff and residents to bring this dream to life in Center Park. The park's theme of "100 Years of History and 10,000 Years of Human Habitation" highlights Centennial’s part Colorado history. The main plaza displays a timeline of the history of the Cherry Creek Basin, and the amphitheater depicts four epochs of human history. A gathering point in the center of the park connects the grand entryway, playgrounds, amphitheater, and parking. We designed outdoor rooms radiating from a hub to provide a variety of experiences and to allow people to be both near one another and remain protected and private with their own parties. Landform was used as a major design component creating outdoor rooms, overlooks, viewing corridors and an overall feeling of comfort and protection from the elements. Dirt was moved from one place to another on the site to sustainably reuse existing materials. The central gathering space, Festival Plaza, ties together the park's components. This is a flexible space used for farmers' markets and other community events. The layout of spaces throughout the park promotes bringing people together to interact and socialize. The splash pad and water play area in Center Park is not to be missed. Don't just take our word for it, users voted it one of the best in the country! Top 10 Splash Pads in the U.S.